2013 ESPCR Membership renewal campaign launched! The 2013 ESPCR Membership renewal campaign has been launched!. All the information you need to know to join or renew your 2013 ESPCR membership can be found in this web page. 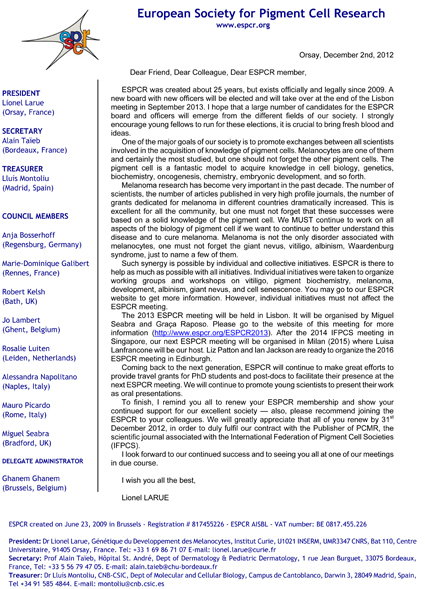 The 2013 welcome letter from ESPCR President Prof. Lionel Larue can be dowloaded from here. Looking forward to receive all membership application and renewal requests! Happy New Year!. Starting today, ESPCR can receive payments by credit card through a specific and secure ESPCR account established in PAYPAL. Currently, three forms of payment are available at the ESPCR for its members, to pay the corresponding annual fees: (1) bank wire transfer, (2) credit cards (via PAYPAL) and (3) cheques. Payments by cheques are surcharged whereas bank wire transfers and paypal payments are not. We hope this will greatly facilitate the registration and renewal administrative tasks, for registering members and for ESPCR Officers. Thanks for your patience, collaboration and understanding.